I plan to retire from the United Methodist ministry this year. Everything will change; nothing will change. Earlier this week, with an email quieter than a whisper in the front pew, my district superintendent informed me that a committee approved my request. Their decision would be forwarded to a next person or group and soon—with hands raised or voices murmuring “Aye”—my experiment as an active clergy will conclude in its forty-first year. I’ve spent long, arduous seconds poring over scripture, seeking the Greek and Hebrew words that might refer to retirement or pension or social security. I’m still looking. Retirement is a modern addition to human folly. I figure my ministry has all been bonus or a burden since my early thirties. Around the time I departed my first appointment as an associate pastor in an urban church to start my second appointment as a solo pastor in a rural town, I became older than Jesus. Depending on which Gospel you want to place your bets on, Jesus was crucified in his early thirties. No retirement for the Prince of Peace. His savings plan was far different than mine. I haven’t regularly preached since a Bush was president, though I do have a swell story ready for any retirement ceremonies I likely won’t attend. In younger years, at annual church conferences, I listened to the old farts when they retired, as they were given a spot in a program to share their wisdom or whimsy. Back then, I decided at my retirement, I’d tell one particular tale I first heard in seminary. Telling the tale probably won’t happen. I’ve been avoiding all forms of official church gatherings where votes were tallied or tabled for over a decade. Why avoid those hallowed gatherings? I’m an introvert (though I can fake appearing extroverted). I don’t like crowds. I’m not much for meetings lasting days rather than hours. 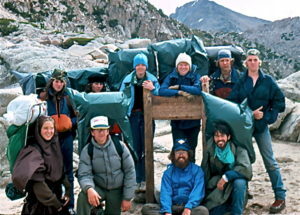 Additionally, most of the remarkable women and men that were once my youthful peers have retired. Or they left the ministry. Too many have died. Some remain active, hopefully still eager to declare God’s fierce love from a pulpit and on another day to comfort a church member wrestling with guilt or cancer or a job loss. For the most part, without any fanfare, after a committee—composed of many pastor-colleagues who’ve never met me—takes their final vote on my retirement, I’ll calmly tip my metaphoric ball cap, and bid good tidings to these wondrous four decades. 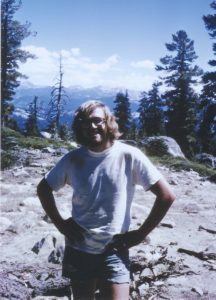 Chronologically, here’s the vagabond path I’ve taken after a bishop laid his hands on me for ordination on a hot, stifling June night in Redding, California: seminary student, student intern pastor, associate pastor, solo pastor, pastor of a three-point charge, new church start pastor, solo pastor (again), campus minister, hospice chaplain, senior pastor, and back to hospice with the absurd title of bereavement support specialist. Beware any minister with a title including special or specialist . . . Liars! Fools! In between there were leaves-of-absence and a token sabbatical. There were escapes from weekly preaching and yet always a hunger to proclaim the Gospel. I have my favorite laypeople in the far-flung spots I served. I’ll honestly confess to day-dreaming of serving a place where all the favorites were magically joined into one congregation. I suspect we wouldn’t get much done, but oh the fun we’d have! Me, I’ve slogged into my sixties with nary an accomplishment. Still, this, though . . . I remember fleeting glimpses of glory, where God’s nudge and my feeble gifts met at the right time for the right person in the right moment. The very best of my ministry happened on church backpacks. The mountains, to paraphrase John Muir, did all the preaching for me. There is good news in alpenglow, campfires, and the Milky Way reflected on a still, dark lake. Nothing like being in community with others who are tired, stinky, and literally willing to walk a mile (and more) beside you. I’ve been with those who experienced their worst pains, who shed tears of incredible joy and shameful sorrow, who said “I do,” who breathed their last, who thought suicide the only answer left, who bravely exposed their souls to me while revealing the anguish of a child’s death or the sweet words of forgiveness offered by an estranged family member. A thousand funerals, weddings, communions, baptisms. (Yeah, I rounded off the numbers.) A thimbleful of great sermons and enough mediocre ones to overload a garbage truck. My dull-witted actions and the dreary times I did nothing. And yet, if only because I believe the Holy longs for creation to remember and rejoice in the best of who we are, I also know that in humbling moments, I’ve helped make a difference for some individuals, some congregations. All we can do is offer ourselves, our feeble faith. Retirement does officially change a particular relationship with my denomination. And yet for a while, as long as they’ll have me, I’ll arrive in my hospice office and try to help. In spite of the callouses on my soul and my clever ways of procrastinating and prevaricating, June 2018’s official retirement won’t prevent me from still stumbling after Jesus. “Part 1” is tacked onto the title because I’ll likely have more retirement musings in a month or year or decade from now. I’m nothing if not long-winded. you made a huge difference in the lives of all of us at willits united methodist church! be happy my friend. Retirement just cuts you loose of daily obligations and allows you to do what you want. A lot of what you want will be what you do now plus the things you’ve put off until you have the time! Now is the time and you will be busier than when you were obligated to work! Funny how that works. Up side, more coffee time! Downside, all those chores you’ve put off until you had more time! Problem solved! Congratulations and good luck! I’m always around if you need to talk!! Terry . . . no daily obligations!!!! Hooray. Well, not really, at least in the immediate future. 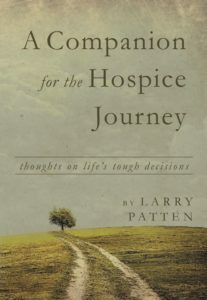 I will continue at hospice and so much of my schedule will not change. Retirement from the UMC is a symbolic, and spiritually important, step. Thanks for your honest, thoughtful reflection on 41 years of ministry, and retirement. I look forward to the next installments. I used to think about things to say in my 2 minute retirement speech. But they stopped having them in Great Plains before I retired. Don’t know about CA/NV. But if they do and you change your mind and decide to go, I’d love to hear what you say. Here’s one thing I said at my retirement sermon at Trinity though: When I was a young pastor, I wore my hair up to look older. When I was an old pastor, I wore my hair down to look younger. . . Neither worked. Sounds like you may still continue to work in Hospice. And I know you will still be writing. Blessings my friend in this transition time. Theresa . . . and I always thought your hair was perfect!! Speaking of follicles, when I was younger, my hair was brown. Now that I’m older, it’s, well, not brown. Thank, Pat. Hey, I always figured there were never enough women behind the pulpits!! But I was never a bishop . . .
And might I recommend going into a private room, behind closed doors, and practice the “R” word out loud? Practice it with a questions mark and then an exclamation point! Oh Larry!!! Blessings on this journey as you continue to be the grace of god to so many! May you continue to be blessed as you have been a blessing … and, of course, I’d love to hear you share — longer than those 8 words — ! Peace…. My favorite pastors are the retired ones. They are more forthcoming, generally relaxed and have been there, done it and can now explain why the way you’re being told to do it is admittedly harder than it needs to be, so here’s how to do it so they are happy and you aren’t miserable. Congratulations. Cherrie . . . relaxed? Hmmm? I still have to work on that one! 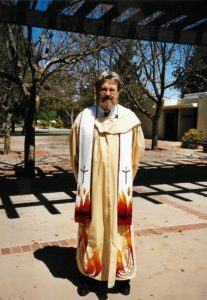 Larry, I came across your website on a whim as I was reminiscing about the past as I am seeing my dear friend this weekend who I’ve been in close contact with since High School and United Methodist Church days in San Leandro CA. Do these names ring a bell – Jane Kerby and Karen Rice. Hellooooo!! Congrats on your upcoming retirement. You were my favorite youth pastor back in the day – can’t believe I am close to retirement as well. Lots of great memories with the Church Family and still see a few of them now and then, like the Bulman’s, Tanquerary’s. 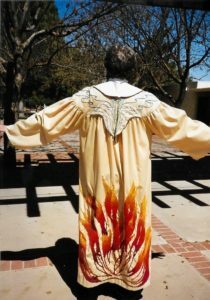 (love the picture of you in the robe Gail made for you). So awesome you still have it!! We need a FUMC Reunion! Blessings to you and Jeanie, assume still married. By the way, Golden Retrievers are the best dogs! We lost ours about 5 years ago. Ready for another one or two! Take care and Blessings to you both!! Hey, Jane, wonderful to hear from you!! YOU WILL ENJOY RETIREMENT; WE HAVE….. ALTHO YOU SAY, NOT MUCH WILL CHANGE. I ENJOY YOUR WRITINGS AND WILL CONTINUE TO READ YOU, AS LONG AS YOU KEEP SENDING. I HAVEN’T WISE WORDS TO CONVEY, ONLY THANKS FOR YOU BEING YOU. KEEP ON KEEPING ON. Appreciate your words and encouragement, Kathy! !